It was a computer-free weekend for me, thus no new entry until today. Sometimes I feel like I spend too much time in front of the computer, since my job is entirely based on working on the computer and I have several projects (including this blog) that see much of my “free” time spent staring at the screen. So this weekend, I opted to take a break from the computer. I did all sorts of exciting things including making beignets, going on a long bicycle ride, and catching some sort of digestive discomfort. Maybe I should have stayed in front of the computer, huh? 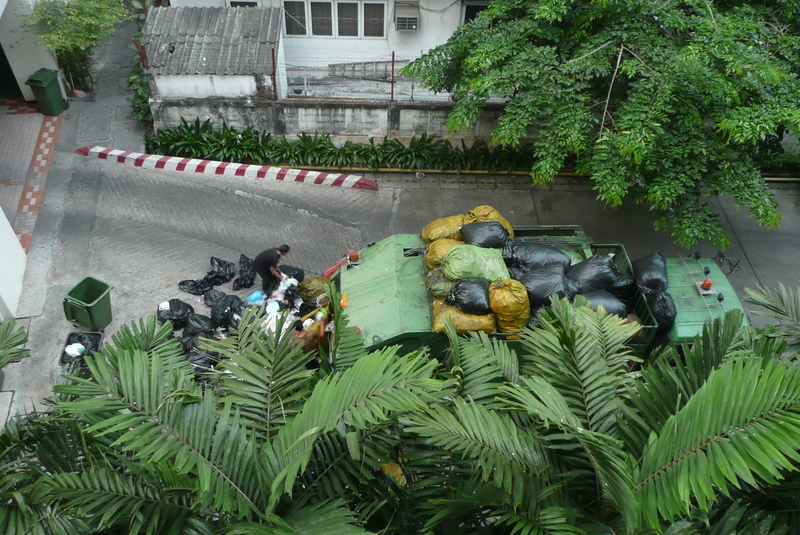 When I first moved to Khrungthep, I was appalled by what I perceived was the lack of any recycling. In fact, on my first trip back to the US, I filled one suitcase with large plastic water bottles (the 5-gallon size, cut in half so they could nest together). It was only later that I discovered that recycling does happen here in the Big Mango, but it is so-called “downstream” recycling. This means that I can throw my rubbish in the bin without a care in the world, and someone who makes much less money than I do, will sort it all our for me. Since discovering that, I started to separate the items that were readily recyclable and place them in a separate bag or container, so they would be easy to find. Also, all of my table scraps and vegetable peelings are put in a milk carton in order to keep the rest of my rubbish clean. But I didn’t realize just how much recycling is actually occurring until the other morning when I was up early. There is a large condo complex, some thirty stories, kitty-corner to ours and three mornings a week the rubbish collectors arrive. Long before sunrise, they are banging around and making noise, but I never really saw what they were doing until one morning when we had the perfect convergence of factors: the sun was rising earlier, they were running behind schedule, and I was up extra early. 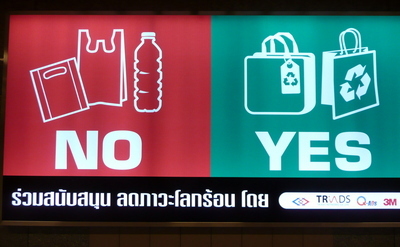 What I saw was eye-opening and gave me a much greater appreciation for the extent to which recycling does take place. The rubbish collectors actually open every single bag of refuse and sort through them. On the back of their truck are bags into which they sort just about everything that could be recycled: glass, plastic, newspaper, cardboard, etc. 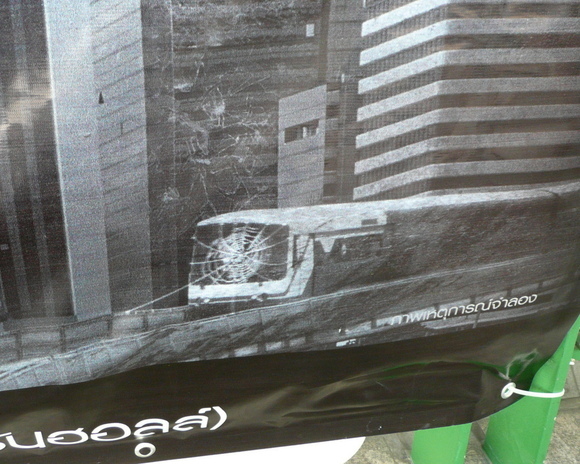 All of the plastic bags – including the ones in which the rubbish was disposed – are collected for recycling. It has to be one of the most unpleasant jobs I can imagine and one of the most labor intensive, too. This just reinforces for me the importance of keeping my refuse as clean as possible. It also makes a good case for using the shredder for any documents with personal information on them. Reduce, reuse, recycling: the Three R’s that we’ve all learned are the cornerstone of environmental awareness. Of course, there should be a fourth R preceding the others: rethink – as in, rethinking processes and systems so they are less consumptive of resources in the first place. It seems that “just saying no” to plastic bags has become the cause de jour all around the world. Designer “I’m Not a Plastic Bag” tote bags are being sold for top dollar, supermarkets offer reusable bags, and t-shirts have been supplanted in the world of freebie giveaways by canvas and cloth bags stamped with promotional logos and environmentally feel-good slogans. That quote leads me to wonder whether or not these types of initiatives are really that effective. Do they really make a difference? They don’t seem to actually change any of the fundamental behaviors of people. We still drive too many cars, live in houses that are larger than we need, consume all sorts of things that are wasteful and extravagant, etc. 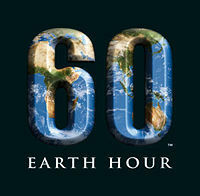 A good example of questionable benefits was the recent “Earth Hour” – a movement to have everyone switch off their lights and electrical appliances for one hour the past Saturday evening. Maybe the value is more symbolic than anything else, but when there are official t-shirts for sale from the website, candlelight weddings and outdoor broadcasts by the Weather Channel using only LED lights, I’m inclined to view these efforts as gimmickry rather than anything meaningful. Another very important point to consider is that some of these efforts are affected by the agendas of their sponsors, more so than honest goodwill and concern for the environment. See this interesting media criticism by Andrew Bolt. As they say, a journey of a thousand miles begins with a single step. Maybe these types of events and actions are those single steps. But until I see people in Western countries showing up at their city planning commission and saying, “Yes, I’d like more mixed-use, high-density development, please” or, “Instead of adding another lane to that freeway, why don’t we add bus rapid transit service?” then I’m going to be skeptical that we’re really rethinking the fundamentals of our relationship with the world around us. Over the last week we’ve had a trio of visitors in town from New York City: Malcolm and Sally and their friend Biing. 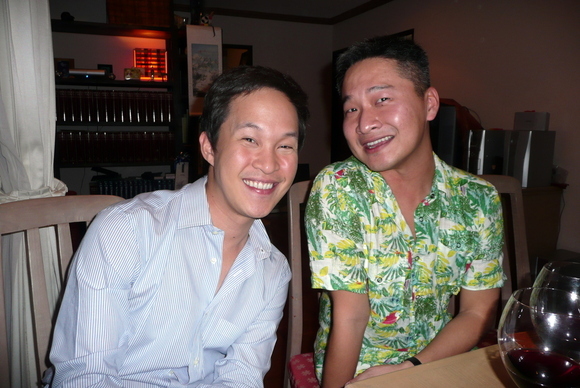 Malcolm is a film maker whom I met working about six years ago at the SF International Asian American Film Festival. 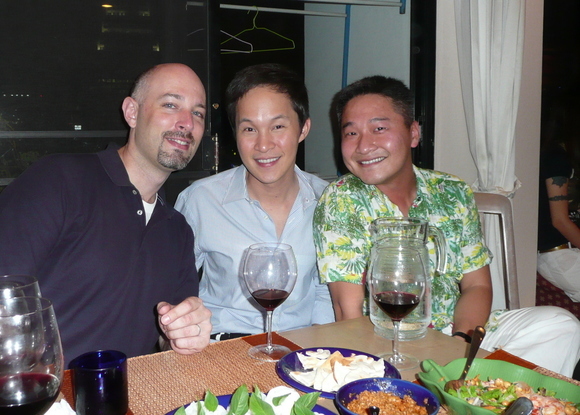 We’ve stayed in touch since then and I’m very glad they had the opportunity to come visit. Their friend Biing arrived first, two days ahead of them. 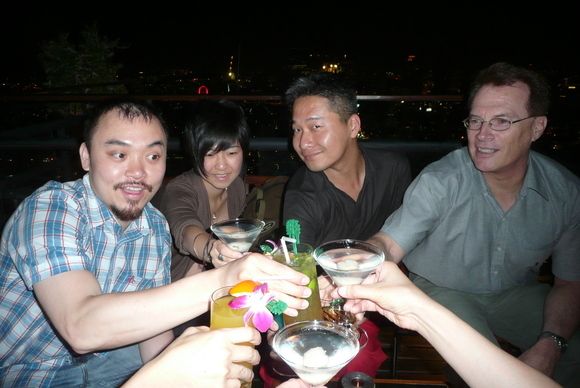 Malcolm put us in touch and he was able to join us last Saturday at Pune’s farewell party. Having never met Biing before, I was initially concerned whether he’d feel comfortable at a dinner party that was half women and the other half gay men. Within thirty seconds after meeting him I realized my concerns were misplaced. Pune decided to cook for us, as she’ll be heading off to her new life in Germany soon and won’t have the opportunity to cook for us anymore. 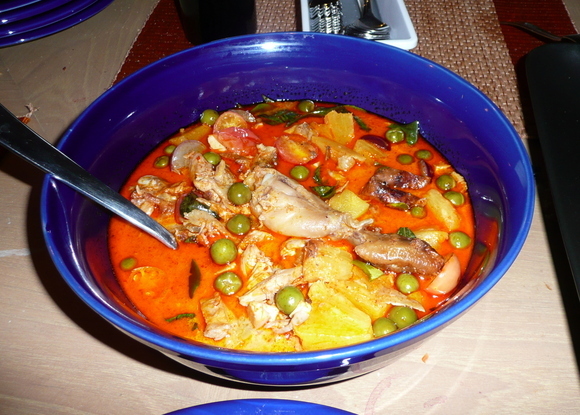 The menu was Thai: spicy ground pork dip (with pita bread, the only non-Thai item), rice noodle nests and chicken red curry. Tasty! 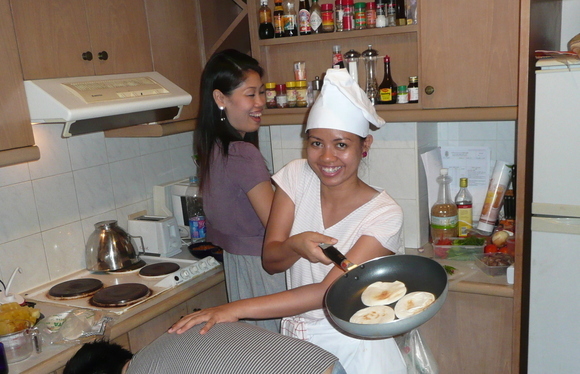 Below: Pune toasts the pita bread; Tam goofs around. Below: Tawn and Issara, Tam’s childhood friend. 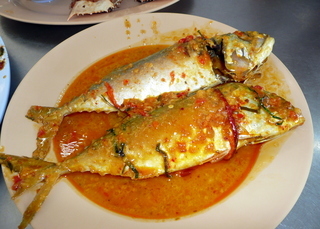 Above: Tawn and Bing. 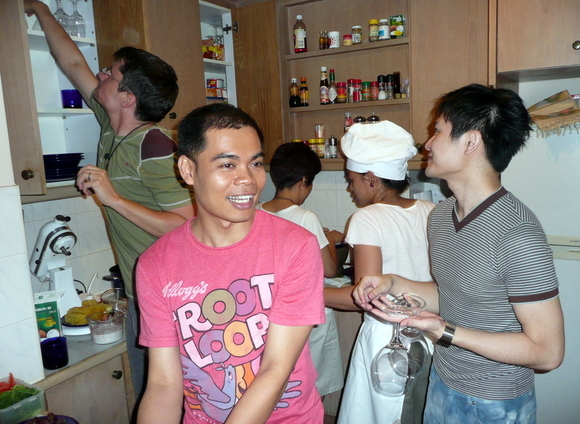 Below: Pune poses with the food, Tam, and Frederic. Above: Me, Tawn and Biing. It made for a very fun Saturday evening and, thankfully, one that wasn’t too late. Sunday morning we were up at a reasonable hour and picked up Biing at his hotel for a trip to the Jatujak Weekend Market. We started on the food side of the market, technically another market altogether as it is open seven days a week. 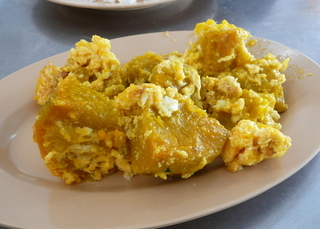 We bought a range of tasty food including a mackerel in curry and a stir-fried pumpkin and egg dish, above. Below, Biing enjoys the food. 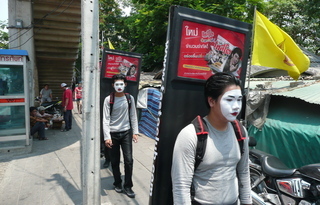 Right, outside the market we saw a group of young men in painted faces out to advertise some product. Don’t know if they were looking so down because of the weather or because of the product they were advertising, but they were definitely sad clowns. Tawn tried on some shorts at a tiny vendor’s stall in the market. There was no changing room or even a changing corner, so the vendor had an elastic-waist skirt you could wear to cover yourself while slipping shorts on and off. At one point Tawn almost forgot he hadn’t put his shorts back on and started to remove the skirt! During their time here, I was able to meet up with Malcolm, Sally and Biing several times. Finally, Wednesday evening Kobfa, Tawn and I joined them for dinner at Tae Ling Pling then met up with Vic on top of the Banyan Tree hotel for drinks. 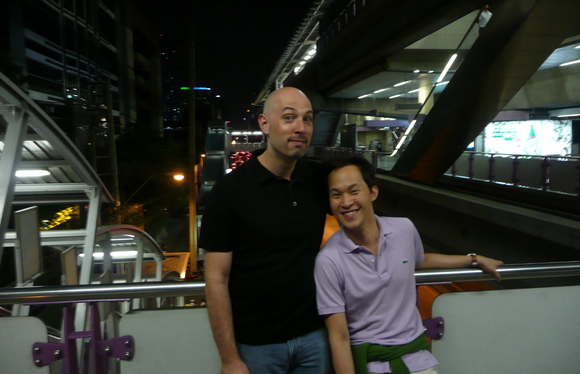 Above: Tawn and I wait at Surasak station for our guests to arrive. 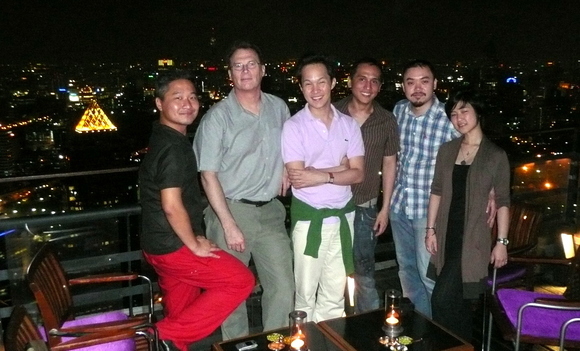 Below: On top of the Banyan Tree Hotel from left to right, Biing, Vic, Tawn, Kobfa, Malcolm and Sally. Between work and my visitors, I haven’t had as much time to update my blog, Facebook, etc. But that’s okay as it was a fun time. Given the recent tragic accident in Cupertino, CA where two bicyclists were hit and killed by a sheriff’s deputy who dozed off at the wheel, the message in this public awareness spot is not only extremely effective, but extremely timely. Thanks to Matt for posting the link to this YouTube video from another blog. 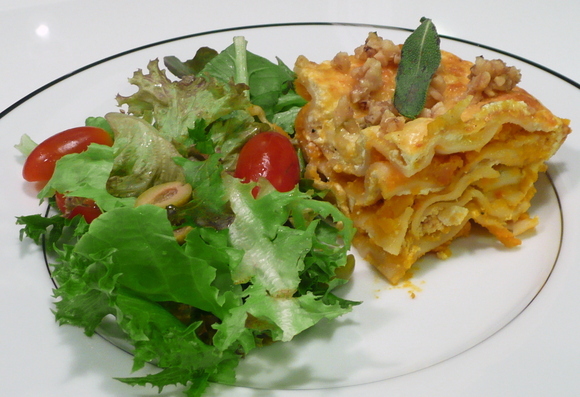 A few months ago I experimented with a recipe in an Australian food magazine for pumpkin lasagna. While tasty, the results were a bit bland with the pumpkin itself tasting flat. Last week I decided to give it another try and see if I could bring out something more in the flavor. 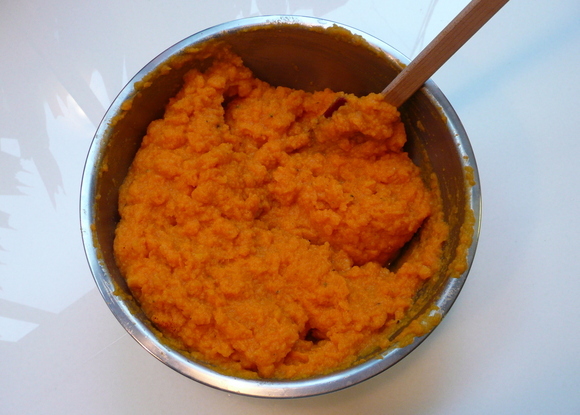 Using butternut squash instead of pumpkin, I baked the squash until tender and then mixed it to a pulp in my Kitchen Aid. The original recipe didn’t call for anything more than a modest amount of salt and pepper. I added more salt and also added curry powder, cumin, and a pinch of cayenne pepper. For the cheese-based filling, I tried a few different things. For starters, I used a combination of jack and cheddar cheeses instead of mozzarella for a sharper flavor that would complement the spices. Additionally, I used a healthy dose of cracked black pepper and ground New Mexico chilies, which add fragrance but not a lot of heat. 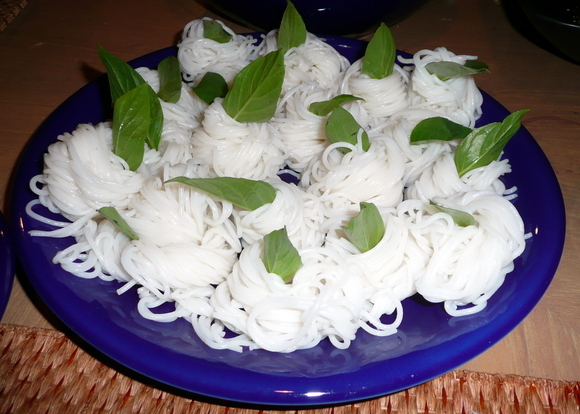 The ricotta I bought was drier than I’m used to, almost like feta cheese, so I had to add water to it so the no-boil noodles would have enough moisture. Two eggs were added to bind it together. 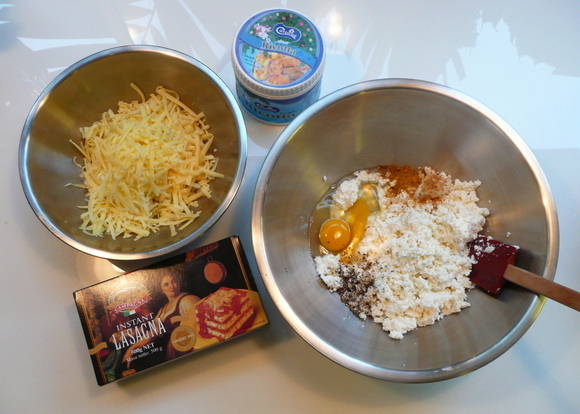 Everything was assembled in the lasagna dish and then topped with more of the cheddar-jack mixture. I covered it with aluminium and baked for one hour at 160 degrees celsius. After removing the cover, I gave it another thirty minutes until the top was golden and the cheese was melted. 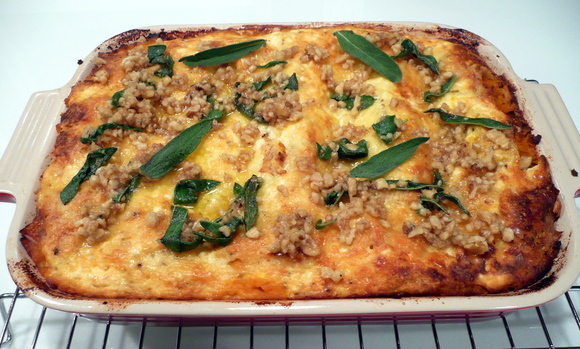 After removing the lasagna from the oven, I melted a few tablespoons of butter with some ground walnuts and fresh sage leaves and then poured the mixture over the lasagna. Below, our table setting. Wouldn’t I like you to believe this is a typical weeknight dinner? 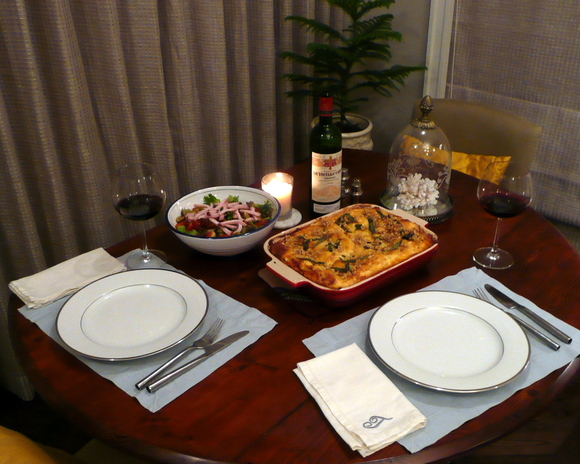 And the results of the effort, a much more flavorful and substantive pumpkin lasagna. Next time, I’d like to try adding back some of the mozzarella to the cheese mixture, though, to get added stringiness. I’m always amazed at how fear can be used to sell things. Sometimes subtly, sometimes quite obviously. 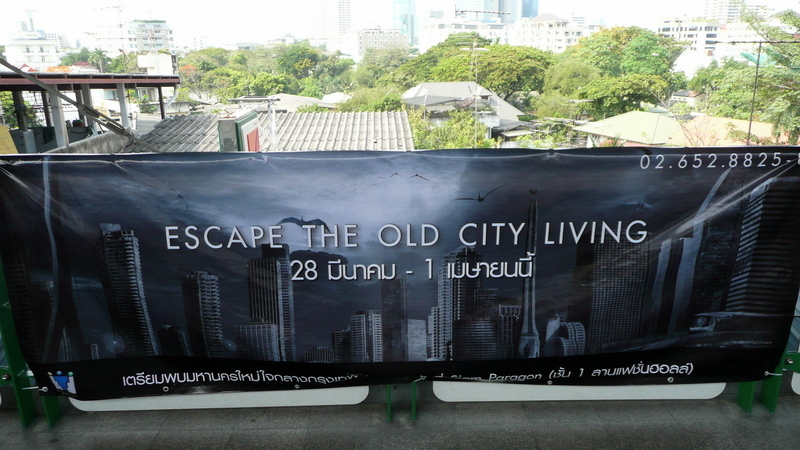 A recent advertising campaign for a new condo complex promised you will be able to “Escape the Old City Living” – pre-sale available at Siam Paragon shopping mall from the 28th of March until the 1st of April. And of course, the true sign that urban decay has blighted the Big Mango is the flock of pterodactyls flying over the city. Because we all know that before white flight from the suburbs really started in the US in the late 1960s and throughout the 1970s, there were many incidents of prehistoric winged creatures in the skies. One can only imagine what local sightings of these fearsome creatures portend for Khrungthep. Fortunately, there are many options if you want a change from the “old city living”. 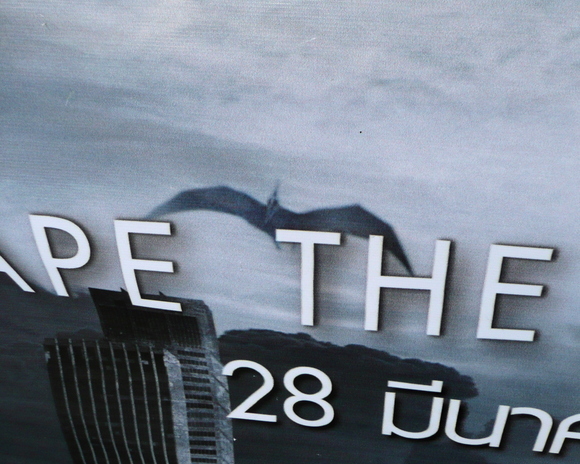 The Bangkok Post today reports that there are no less than 17 condominium projects going up between Sukhumvit Sois 53 and 63 – the distance between exactly one stop on the Skytrain. 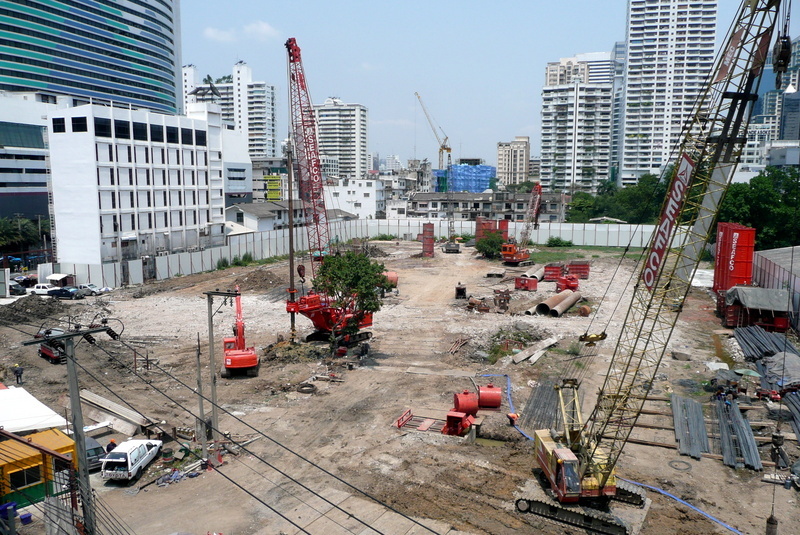 Here’s the fast progress being made in the large property adjacent the Asoke BTS Station. Formerly a Ford and Volvo dealership, it will become a large multi-use complex in the next eighteen months. Monday evening, St. Patrick’s Day, we enjoyed a huge treat. 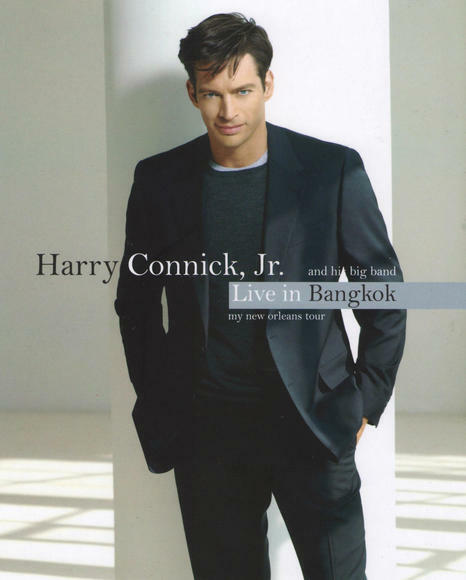 Harry Connick, Jr. and his big band came to the City of Angels to perform in support of his “My New Orleans” tour. 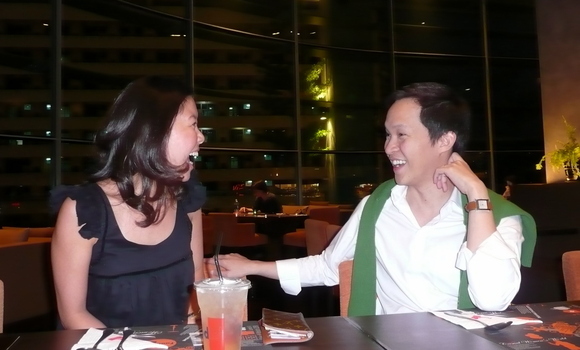 There were twelve of us in attendance and we preceded the concert with dinner at the Zen Food Loft. 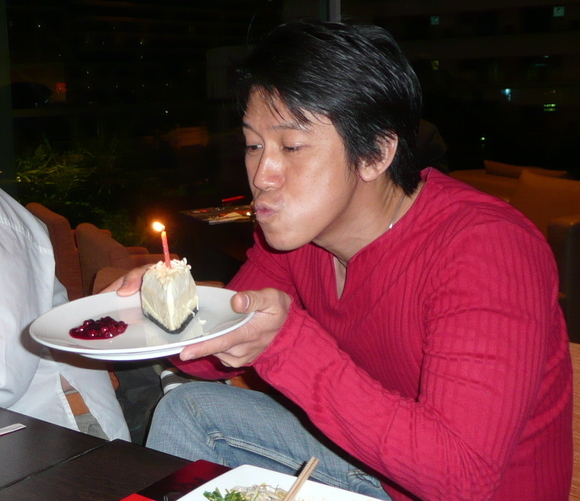 Tawn’s friend Fuyuko joined us – a too-rare pleasure, above – and in Ken’s absence we celebrated Chai’s birthday which is on Wednesday. I brought a candle and a lighter in my bag and then we put it in a slice of cake and sang “happy birthday” for him, below. As for Mr. Connick, the 41-year old singer, pianist, and actor was making his first visit to Khrungthep and brought two of his three daughters with him. At one point near the end of the show, he called them onstage and did an impromptu interview, asking them about their impressions of the city. Both said it was their favorite place on the tour. Mr Connick’s band is straight out of the Big Easy and many of the numbers they performed were classic jazz with a Dixieland flavor. Lots of brass, lots of improvisation, and everyone in the band was having a good time. To top it off, in addition to being a talented musician and vocalist, Mr. Connick is a true entertainer. He interspersed songs with lots of self-depracating banter, knew a little bit about the local culture – the band even performed one of the popular jazz songs His Majesty the King had composed, and generally clowned around. Early in the evening, his right contact lens came out and he proceeded to use the lens of one of the cameras as a mirror while putting it back in. 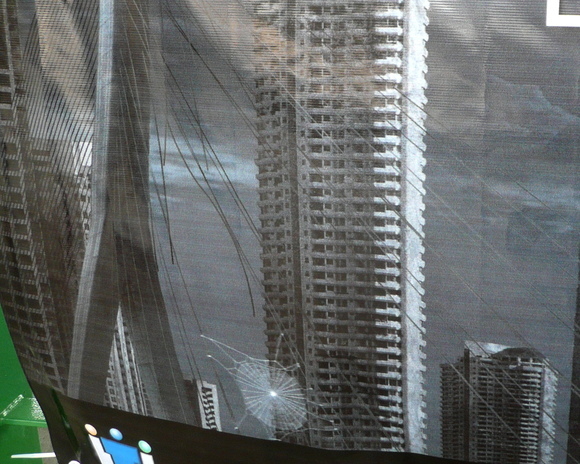 Of course, that camera’s view was the one showing on the big screens so we saw a closeup of all this. Afterwards, he joked that he had used the same hand to put in the contact lens, as he had used just before the show to pick the hot peppers out of his pad thai noodles. For several minutes there was an ongoing joke about him crying from only his right eye because he was only half sad. 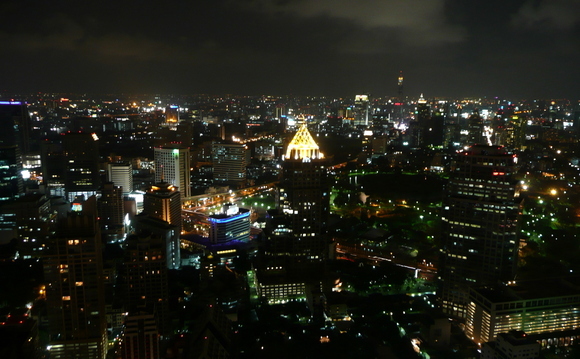 It was a very fun time and the audience, seated in the Bangkok Convention Centre at Central World Plaza in a layout that was more appropriate for a business meeting than a jazz concert, warmed up appreciably as the night went on. By the finale of the concert, people were literally dancing in the aisles. Even thought security checked for cameras, as usual they didn’t look very hard. Here are two short clips – 1:08 and 0:36, respectively – from the encore, just to give you a flavor of the concert. Taxes are done – need a recommendation? Yeah – my 2007 state and federal taxes are complete! Nice to have that done and out of the way. Many kudos to my H&R Block tax adviser, Mary Reichenbach of Overland Park, Kansas. She’s been fantastically easy to work with over a distance and has helped me navigate some of the complexities of being an expatriate American, at least with regards to my taxes. With my return I received some coupons for recommending friends. If anyone wants to use her services, let me know and I can send you the coupon.